Special baby gift. Enter baby's name or nickname and select the colour of embroidery thread for the text. 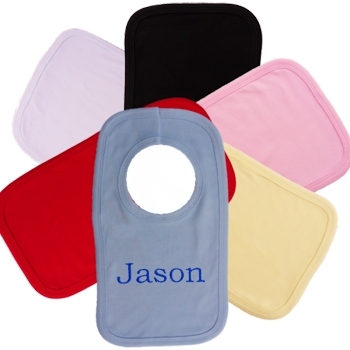 The bib is good quality and made in the UK. 100% double layer cotton pullover bib to help keep clothes dry and free from stains and is easy on and off pullover the head. All embroidery gifts are especially made to order by Amys Gifts, we do our best to get all orders dispatched within approx 48 hours.